Plate 23 from the first set of Thomas Daniell's 'Oriental Scenery.' 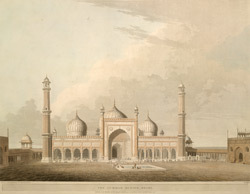 The Jami Masjid, the largest mosque in India, was built between 1644 and 1658, as the principal monument of Delhi, the new capital of the Mughal emperor Shah Jahan, established in 1638. The Mosque stands on a high platform on a rock and has three huge gateways approached by broad flights of steps that lead to a big courtyard. The minarets and domed prayer-hall are ornamented in white marble and deep red standstone and the doors are decorated with brass carvings.